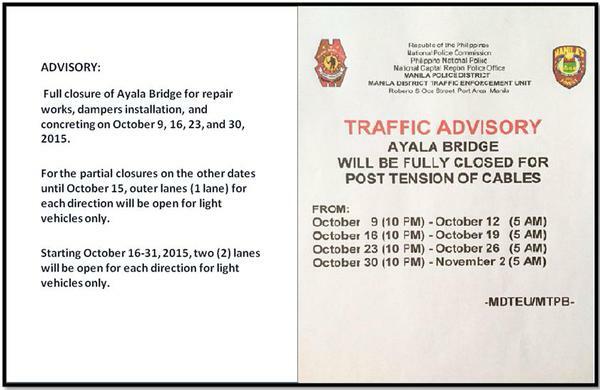 SCHEDULE: Ayala Bridge closed to traffic for 4 weekends of October - Balita Boss! Due to repair works, dampers installation and concreting, a closure of Ayala Bridge in Manila will take place every Fridays at 10 PM through Mondays at 5 AM specifically between October 9 to 12, October 16 to 19, October 23 to 26, and October 30 to November 2. Ayala Bridge will be one (1) outer lane open in each direction for light vehicles during weekdays wherein additional lane in each direction may be opened by October 16-31, 2015 as work progresses. Here's the traffic advisory coming from Metro Manila Development Authority (MMDA).